The developers have included a new PowerShell module PackageManagement in Windows 10. PackageManagement (earlier called OneGet) allows to install, manage and uninstall applications and programs from an external (or local) repository, and manage the list of connected repositories from the PoSh console. In other words, now you can install programs from the command prompt in Windows 10/ Windows Server 2016 like they do it in Linux using the well-known command apt-get install. The PackageManagement module makes it easy to install new software. The installation comes down to running a single PowerShell command, and a user doesn’t have to search and download software distributions in the Web, thus reducing the risk of downloading an outdated or infected programs. Software is installed from a trusted source. When software is updated in a repository, it can be automatically updated on the clients. PackageManagement module is already integrated in Windows 10, and it requires PowerShell 5. To make PackageManagement work under Windows 8.1, you will have to install Windows Management Framework 5.0 first. Microsoft has also issued a separate PackageManagement module to work in PowerShell v.3 and 4. By default, there are two installed package sources in the system: nuget.org and PSGallery (official online gallery of PowerShell scripts from MSFT). First of all, they are designed for programmers and system administrators. Note. In Nano Server, there is a special provider NanoServerPackage that will be discussed in the next article. To access the application software repository, let’s connect a popular software repository – Chocolatey containing over 4,500 different programs. Confirm the provider installation by pressing Y. 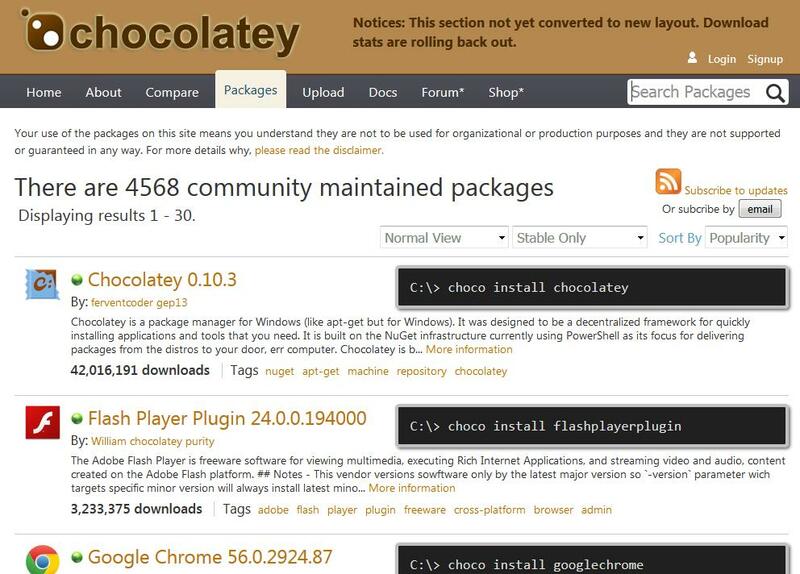 Make Chocolatey a trusted package source in order not to confirm package installation each time. Let’s see how to install an application (a package) from Chocolatey. The list of all packages containing this keyword will appear in the console. 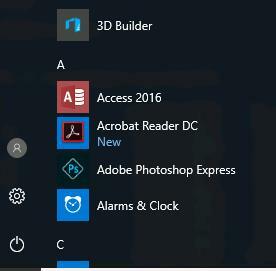 We need adobereader (it is the package name from the Name column that we need to use). 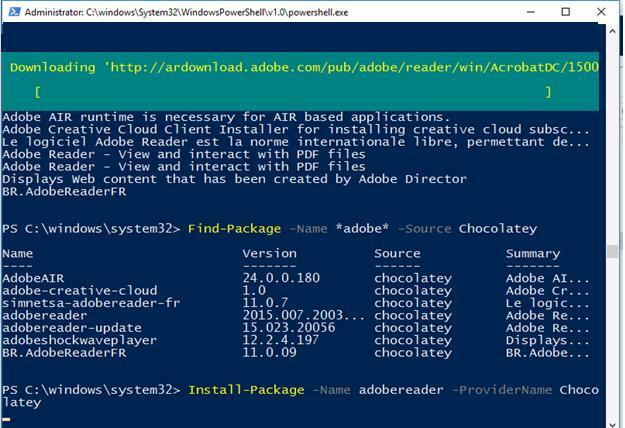 On the top of PowerShell window, a slider will appear that indicates that Adobe Reader package is being downloaded. Immediately after the download is completed, the application is installed on the system. Another example. Suppose, you need a set of tools SysInternals. 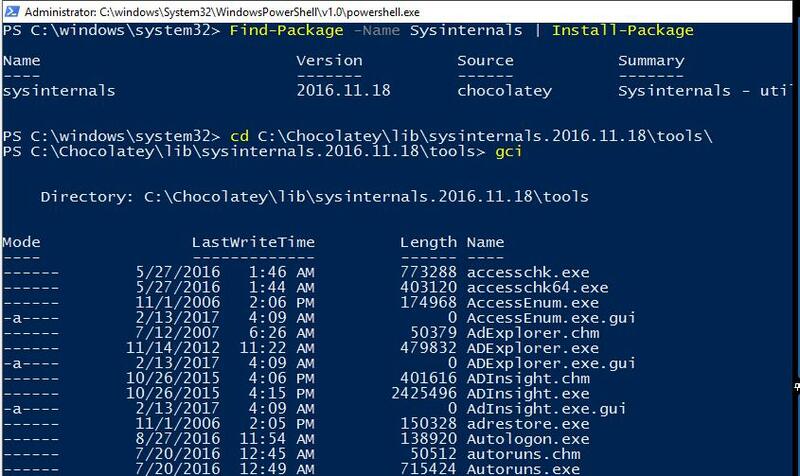 In order not to download it manually, find SysInternals package in Chocolatey and install it. So, we have considered a new ways to install Windows applications from the PowerShell command prompt. In the nearest future, graphical add-ins for PackageManagement may appear that allow to easily manage installation/uninstallation of software for common users without CLI skills.